Wrapping up “Julianna week” here at So Much to Say, So Little Time. This week, I participated in a research study. The researchers are asking people about their experiences at and around the time they received a diagnosis of a “congenital condition,” such as Down syndrome. I decided to share some of my answers today as my 7 Quick Takes post. As you will see, we had lots of frustration. So before I get started, I want to say that my Ob/Gyn, who gave us the diagnosis, ROCKS, and so does the lactation consulting staff at the hospital where we delivered. I wrote these responses quickly, and I’m choosing not to edit, so please bear with the less-than-stellar prose today. How long was it from the time you or your healthcare professional had concerns until a diagnosis was made? They told us about 2 hours after birth; we had a FISH diagnosis less than 48 hours later. What support were you offered? If you were not offered support, did you seek it out? Where and how did you find it? Support came primarily from our family members and acquaintances, who put us in contact with early intervention. 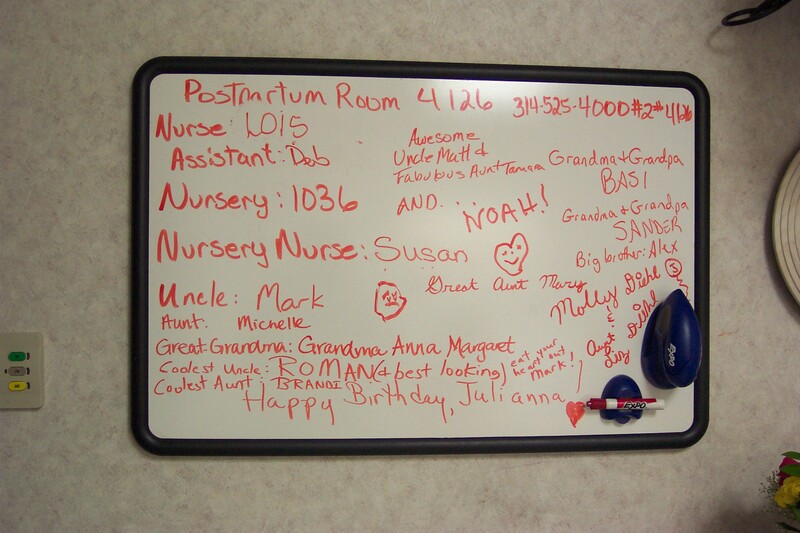 A friend of a family member was a doctor who came in to speak with us; we also happened to be in the hospital at the same time as a couple who had a sibling with Down’s, and we were able to make contact by passing messages through the hospital staff. The hospital staff, however, didn’t know what to do with us, really. Describe your impression of receiving the diagnosis and the time that immediately followed, such as getting support and information. I know it's blurry, but you get the idea. One. Two. nurse. Then, when the report came (2 months later! 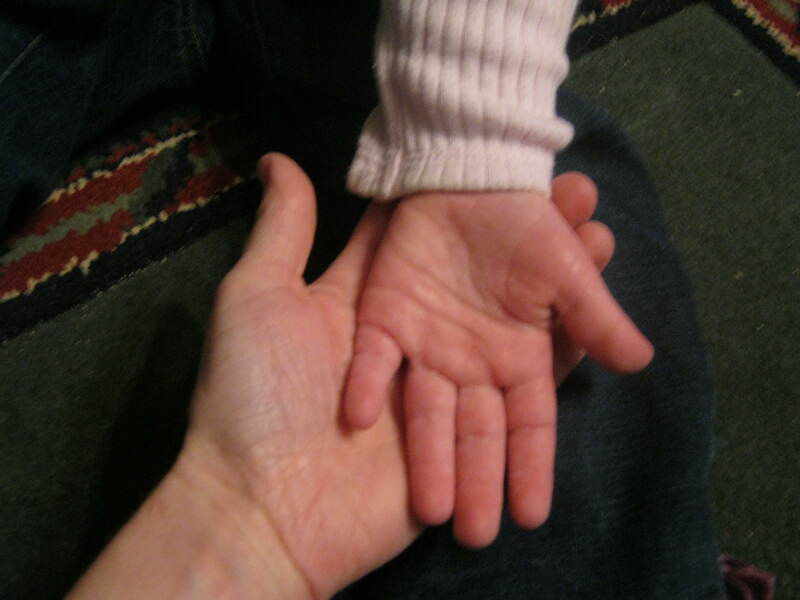 ), it was like they had lifted the textbook description of Down’s and plopped it into the report, including the statement that my daughter had the typical DS single crease on her palm–which, incidentally, she doesn’t. I was so offended by this, I still get mad about it. Once we got hooked up with early intervention, things changed markedly for the better. We had great team members and also good support from our church & family. Most: Just knowing that people were all around us and offering to help. My husband found all the medical knowledge helpful; I just found it overwhelming. It also helped to talk to a parent, who could put everything in perspective and say: step 1. Step 2. Step 3. It gave us a place to start. Least: Doctors who made assumptions about my daughter and didn’t bother making a detailed examination of her before forecasting a dismal future. How has having a child with a congenital condition impacted your family? We have had to arrange our schedule around hers so that she gets the services she needs. But outside of that, having a child with Down’s is a lot like having any other child. You take it one day at a time, you learn their preferences and strengths and weaknesses the same way. There are things we have to think about differently, like education and future planning, but the day to day life looks a lot like it would have if she’d been born with a normal number of chromosomes. What is one tip or resource that you wish you knew about, or words of wisdom that you wish someone would have shared with you during this experience? It’s all too easy to try to process the whole experience of parenting a child w/special needs all at once. You don’t need to know all the details about adulthood, life expectancy, even preschool, on Day One. A baby is a baby. They’re all helpless & can’t hold up their heads. They all learn things one day at a time; their development unfolds one day at a time–just like every other baby. It’s just slower. You have lots of time to process what may or may not happen to your child. In the early part of the process, all you need is to do is feed, clothe and cuddle them. Just like every other baby. My son is on the autism spectrum, but wasn’t diagnosed until he was eight. While we knew early on that “something” wasn’t right,we just attacked the problems as they appeared. Even so, hearing the word wasn’t fun. I agree with you about just taking it one day at a time and treating them as the individuals they are rather than as a syndrome. I especially like your advice in #7. We would all do well to follow it for any number of unexpected surprises in our lives. Thanks for the reminder not to get ahead of myself. Great list: I have really learned the wisdom of #7 from the nurse perspective ~ I start with the usual instructions about caring for a newborn and augment where needed. So glad you found good support from others in the same trench; that seems to be the most useful in those early days. Very interesting. Thanks for sharing. And boo for assuming doctors! I was particularly saddened by it b/c it’s a Catholic hospital. I guess they just don’t see the kids coming through. I love #6 and #7. I was so sad to hear about your experience in the hospital. Our recent experience was SO much different and I’d like to share it since it was so different. My husband wondered if Luke had DS as soon as he was born but did not say anything to me right away (he is a Family Doctor). He waited until the newborn exam the next morning when the pediatrician started by telling us how healthy Luke was and then mentioned very gently that he wanted to have the pediatric geneticist come in and do a second exam because he was seeing a few characteristics that were typical in DS. She came in and right away told us that while we would have the blood work done that she was certain he had DS. It was a relief to not have to wait to find out. The next doctor we saw was the OB who delivered Luke. She congratulated us and told us that her 17 year old son’s best friend since Kindergarten was a young man with DS and gave us his mother’s home phone number and told us how amazing he is. We felt completely taken care of and reassured that we could raise Luke and that he would thrive in our home. It’s not easy to find out that your baby isn’t quite who you thought they were going to be – but it’s wonderful to realize that they are exactly who God intended them to be. It’s always good to see when things are handled well for people. Our Ob came in to tell us the news, which was a very good call b/c he had a relationship with us, and it was particularly meaningful because I know how busy he is and how many people waited over at his office while he came back to the hospital to minister to us. It was only in the aftermath that we got so angry with some of the medical personnel we encountered, both at the birth hospital and back at home.